Want something no one else has? Here’s your chance. Be the first to pre-order our new flavours of Mana Powder: luscious Love with strawberry and raspberry, summer Sunlight with tropical fruit, and delicious Dream with mellow cocoa. For a limited time only, we are offering discounted prices before sales officially launch. Mana Powder is a nutritionally complete food that is ready to eat in minutes. One portion provides 20 g of protein, a full serving of fibre, high-quality carbohydrates and valuable fats. One pouch contains 5 portions. We'll also throw in a Mana t-shirt for free! Orders will be shipped as received starting in April 2019. Quicker and easier preparation, with no more imprecise mixing of oil and powder. Just mix with water, and you are ready to go. Our vision has always been to design a compact, all-in-one food product. One that saves us time and energy, so that we can focus on what's really important. Thanks to new “high-speed cold mixing” technology, we have been able to do that by combining oil and powder into a single substance. We have reduced packaging size by 20%, and the amount of plastic we use by an incredible 50.2%. Better packaging saves on pallet space, transport fuel and production energy. Our carbon footprint is now smaller than it has ever been. What if you had a solution which took the hassle out of mealtimes? What if you could just drink a nutritionally complete meal in a few seconds? It’s time to stop skipping meals and eating unhealthy when you are pressed for time. Experience Mana, your futuristic powdered food. MANA is lactose free powdered food with sweetener - complete meal replacement for the daily diet from 18 years of age. Intended for special nutrition. Store in a dry, cool place (max. 25° C, not in the fridge). After opening, consume till one month. INGREDIENTS: Maltodextrin, Soy protein isolate, Canola oil, Oat fiber, Isomaltulose, Soy lecithin, Sea algal oil, Cold pressed coconut oil, Sunflower oil, Acacia gum, Minerals (Sodium (Salt), Potassium (Potassium chloride), Calcium (Calcium carbonate), Magnesium (Magnesium oxide), Zinc (Zinc oxide), Iodine (Potassium Iodate)), Xanthan, Cold pressed flaxseed oil, Sucralose, Vitamins (A (Retinyl acetate), B1 (Thiamine hydrochloride), B2 (Riboflavin), B3 (Nicotinamide), B5 (Calcium pantothenate), B6 (Pyridoxine hydrochloride), B7 (Biotin), B9 (Folic acid), B12 (Cyanocobalamin), C (Ascorbic acid), D2 (Ergokalciferol), E (Tocopherol acetate), K1 (Phylloquinone)), Aroma. 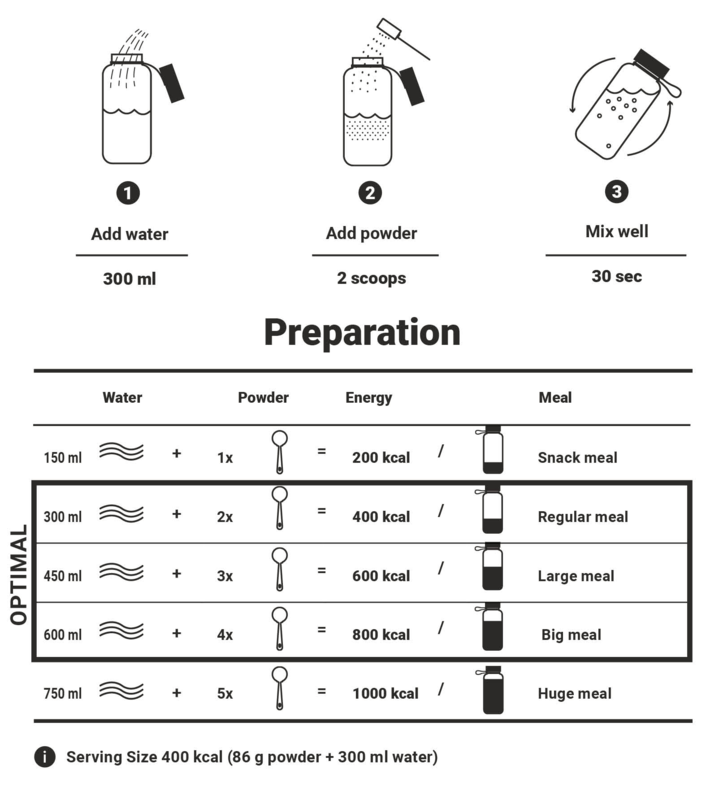 PREPARATION: For one serving, you need 86 g of powder (2 scoops) + 300 ml of water. Mix well.